Christian Café has been matching single Christians from around the globe since 1999. They are proudly Christian-owned, and can boast over 25,000 marriages from singles meeting on the website. Uniquely, they offer full functionality of the site for a completely free 10 day trial to help you make the right choice for you. This includes instant messaging, inbox chat, forums and plenty of religious dating advice. It takes moments to sign up to Christian Café, and is all done directly from the home page. You will be asked to enter your email address and choose a username. While members will see your username, your email address will be kept private. You can then enter your location, date of birth, and answer whether you were referred to the site by another member. That’s it! You’re ready to start enjoying the perks of your free trial. You will be immediately directed to your profile page. Here is where you can answer some more detailed questions about yourself to show other members of the site who you are. These include physical appearance, Christian values, lifestyle choices and schooling/employment. Christian Café ask that If you are still legally married you don’t join the site, even if you are separated. This makes for a really safe and fair environment to find love, knowing that everyone is free to meet their perfect match. A great extra here is the ability to choose what kind of relationship you want. This can be friendship like penpals, or love, marriage and the ‘open to possibilities’ option. In terms of Christian profile options, you couldn’t ask for more. You can choose how important your faith is to you by including that it ‘defines who you are’ or ‘you believe in God’ or somewhere in between those. You can be completely honest from the outset by saying you’re still trying to figure it out! You can then choose from a long list of denominations, or choose to call yourself ‘Just Christian’ too. You can also include how often you attend Church here, and what your involvement is. At this point you can enter the site and start browsing profiles. You will however be prompted to complete a full profile either now or at a later date. While the questions you have answered so far are great for helping others find you in the search results, once they do they will want some more information about what makes you tick. Your profile includes many open ended questions, from your dream date to your personal goals in life and your favorite verses from scripture. 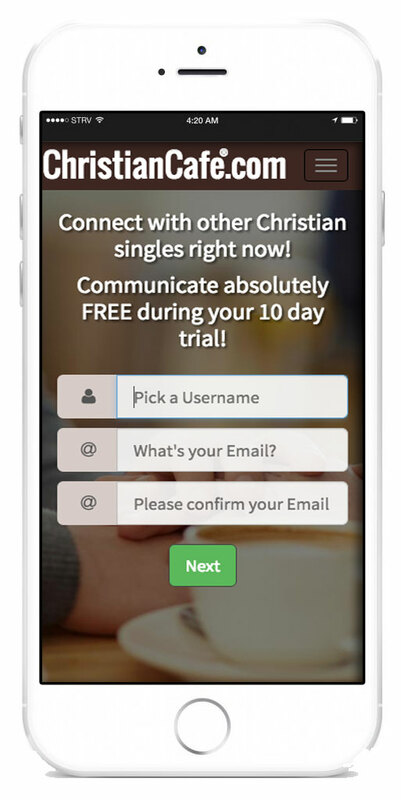 Christian Café is a really fun and easy online dating experience from beginning to end. The website has loads of great features without overwhelming you with options you don’t need or which don’t add value. From the home page you will be able to see a link to the Christian Café blog which has news about the site as well as fantastic relationship advice and tips for religious singles looking to meet the one. You will also be shown the seven ways you have to meet people on Christian Café. You can use the QuickMatch service, which matches you with ‘basic’ search criteria including age and location, or customize your own search by narrowing it down with any of the sign up filters you used when you joined. If you’re looking for something specific, such as someone of a particular denomination here is where you make sure your matches suit your preferences. You can also have a lot of fun here looking for members with a certain physical appearance or lifestyle. If you want to try the instant messaging feature, you’d better go straight to who is currently online, and you can also browse through new members. Here you will see exactly how popular the website is for Christian singles, as there are literally thousands of new singles weekly. You can also search by Birthday or Username. The forums are a great way to chat with groups of people and answer some questions you might have about the website, or even life and love. They are helpfully split into categories such as for men, for women, single parents, under thirties and more. You can also join forums about topics such as Travel, Food, Sports, Book reviews, and dozens more besides. A great Christian extra is the ability to write and post your own Prayers for other users to see. If you head to the community tab you will see that plenty of members have taken the opportunity to post prayers of thanksgiving or requests to God, which is a great way to see how serious people are about their faith and relationship with the Lord. With an entire overhaul for 2016, Christian Café have updated their website so that it is entirely optimised for mobile and tablet devices. Not only has this made it easier to search, chat and date on the go but it has also increased the amount of members online at any point. We love the easy to use touch-friendly interface, as well as the intuitive user buttons made specifically for smaller screens. They also have 2 mobile apps available for Apple and Android devices which you can download easily from the app stores. One of the best things about Christian Cafe is their industry leading 10 day free trial. This starts as a 7 day free trial and then you can add an extra 3 days on by posting a photo on your profile. During this time you can use the site as a fully fledged member. As well as these options, you can also sign up for 1 month for $34.97, or try the site for two weeks for the cheaper cost of $29.97. The website is fantastic value for money, and the free trial proves they are proud of the service they provide and have nothing to hide. The help section on the website is extensive, and covers all the major aspects of using Christian Café. These include search, profile and communication tools. You can also look at the tips on keeping safe both on and offline, meeting new people safely and avoiding scams. If you have any issues at all, you can email the site directly or use the contact us form from the help page. Christian Café was always a great choice for single Christians looking to find love online. However they have ramped up their game for 2016 with a brand new gorgeously designed website which is specifically aimed at being mobile and tablet friendly for dating on the go. Add this to the great communication tools and profile options and you have the #1 choice for serious Christian dating online.